Cowboy Action Shooting™ is the fastest growing shooting sport in the country. It's worldwide. It exists in places where getting firearms is difficult and expensive such as Great Britain, Australia, New Zealand, and Austria. The Single Action Shooting Society™ (SASS™) assigns member numbers when you join. By the time you read this badges in the 70,000 range will be issued. I joined in 1999 with a badge # of 24287. SASS™ has GROWN! Over 50,000 people participate in the US every year. Over 10,000 people are starting at it every year in the US alone (judging by the new SASS member numbers). The simple fact is it's fun. Major events take place all over the country involving hundreds, sometimes thousands of people. 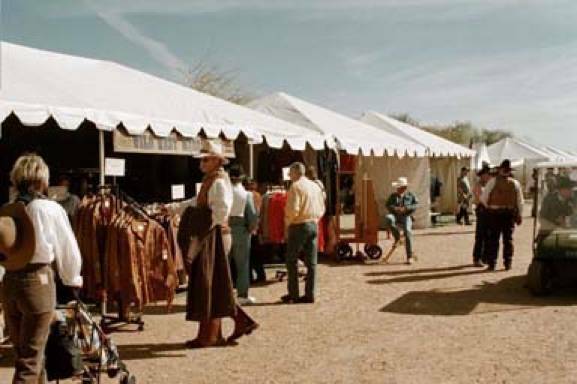 This is a scene of part of vendor's row at Winter Range 2001, the U.S. National Championship, where the shooting field was limited to 500 shooters and was expanded to three days of main match shooting in later years to accommodate 750 shooters, but conventioneers and vendors add a few hundred more. You could go to a match like that with a pocket of cash or a credit card and get almost everything you need to shoot the sport from guns to clothes to hearing protection to gun carts, etc. (Don't panic. We'll show you how to do this without breaking the bank.) If you need a set of 1876 pattern U.S. Cavalry boots or a red paisley wild rag, it's probably here. 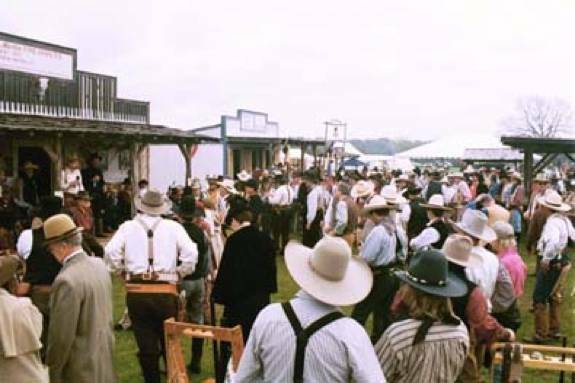 Cowboy Action Shooting is the only shooting sport with a dress code. You should be dressed in costume. The efforts put into the costumes are remarkable. Contestants can be 1. Real 19th century figures, 2. Fictional 19th century figures, from novels, TV, or movies [all of the Sacketts are portrayed. There's a Hoppy and a Paladin (and a Wire Paladin and a Texas Paladin, etc. ), and every Clint Eastwood or John Wayne character, etc.] 3. A made up 19th century character. Aliases range from Judge Roy Bean and U.S. Grant to Three-Eyed Willy to Meadow Muffin to Dirty Dances With Wolves to Trudy Grit. (The one which caused me to roll on the floor was Squatztachute). Each shooter is required to pick a unique alias, and since there are 85,000+ members in SASS, this is difficult. Each alias must be different, or, no doubt, we'd have 250 Paladins and 200 Rowdy Yates, etc. A Fairly complete listing of Aliases is at Piney Woods Place. SASS™ doesn't publish a list of aliases, so calling them usually is the best way to find out if the alias you want is taken. SASS has added an alias lookup, but I'm not sure how good it is. I just tried Captain George Baylor, George Baylor, Captain George W. Baylor, and Capt. George Baylor, and no matches were found. To get started, visit the web site and find a club near you. Their web site will tell where they shoot and when. Go and watch a match. Talk to the shooters (while they're not shooting or loading). I've never talked to a CAS shooter who wouldn't tell you all of his secrets. I've heard World Champions give load data to people they didn't know, and shooting hints are freely given. Everyone there wants more shooters. Most shooters will even loan their firearms and leather gear to help you get started. 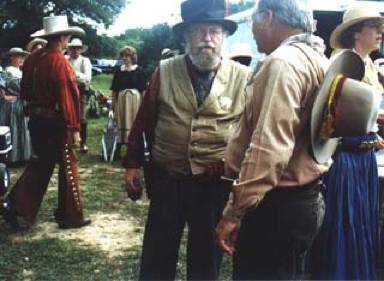 Shooters' meeting at Gunsmoke, Texas at their annual match, Trailhead. 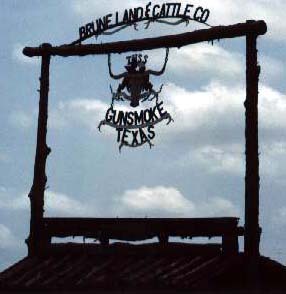 Gunsmoke, Texas is operated by the Texas Historical Shootist Society. Gunsmoke, Texas has a whole lot of buildings like this, administration on one side of the street, shooting stages on the other. It is a very impressive place, built entirely by the members. They will have 60-150 shooters. They shoot on the third Sunday of the month. I'm retired now and live in a motor home. I winter in Phoenix because the National Championship of Cowboy Action Shooting is there in February, and I can practice daily at the Cowtown Cowboy Shooters Association's home, Cowtown, where targets stay up permanently. I can also shoot matches in the facilities used for Winter Range, the National Championship when shooting monthly matches with the Arizona Cowboy Shooters Association. 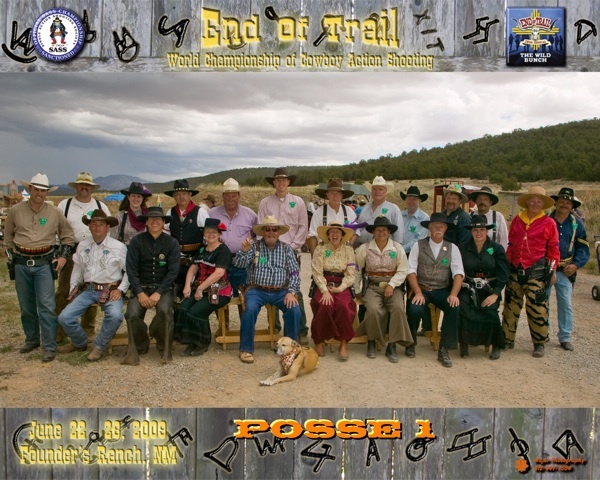 In the summer I live in Albuquerque because End of Trail, the World Championship of Cowboy Action Shooting is there. I shoot with several clubs, so I can shoot every weekend and some Wednesdays. Before I retired, I managed to shoot at two clubs in the Houston area (out of a growing number — you can find a club within 150 miles of Houston shooting on any given weekend, even the fifth weekend when it happens). 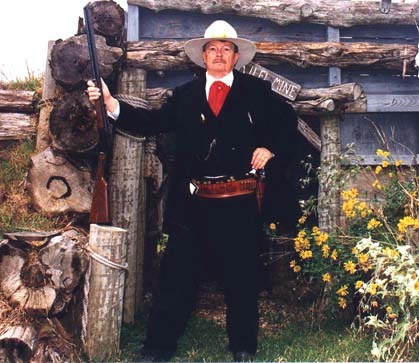 The other one was the Tejas Pistoleros. 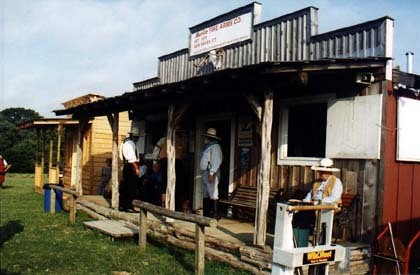 Their facilities weren't as fancy as THSS, but they were very friendly to beginners, especially beginners without full old western clothing rigs and all 4 required guns. Cowboy Action Shooting™ facilities range from the very simple to the established. 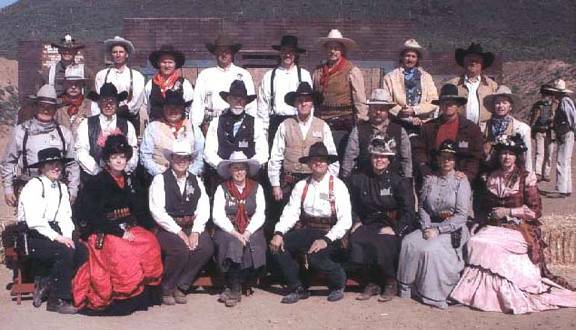 Gunsmoke is above average for a facility because it's permanent, and the members have been working very hard to improve it for several years. Some facilities are professionally built. Some are temporary with matches set up using portable props. It doesn't matter, though, because the people are invariably friendly and helpful to a fault.